The Canare L-4E3-2P 200M 2-Channel Star Quad Microphone Cable (656' / 200 m) is a 25 AWG Star Quad snake cable with braided shields. Each channel is completely isolated and consists of 4 conductors surrounded by an overall braided shield encased in a color coded striped PVC jacket. The 4-conductor style construction minimizes the loop area between twists of the conductors. This double balanced pairing reduces susceptibility to electromagnetically induced noise. Fine conductor stranding for flexibility facilitates roll up and easy payout. 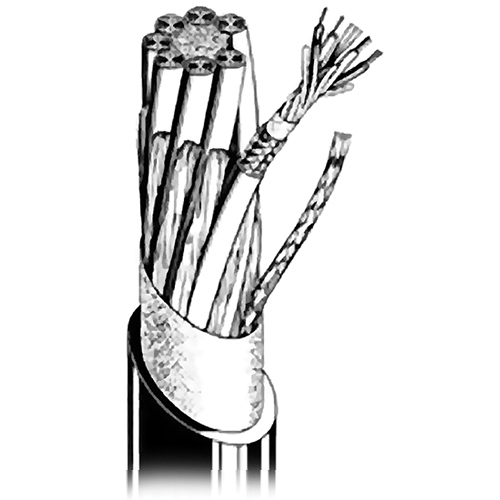 Large numbers of thin wire strands are used in the copper conductors and overall braided shield. A special compound PVC outer jacket is extruded that remains pliant at extremely low temperatures with no wait between cold shipping and installation. The 4-conductor design provides superior EMI and RFI noise rejection in problem areas on the stage. Good crosstalk characteristics allow different signals (-120 dB mic, 4 dB line, 10 dB code levels) to be used in adjacent channels. Note: All Canare DT12 Snake assemblies are built using our road-worthy and flexible L-4E3-12P cable. The PVC outer jacket is tough, strong, and durable with good flexibility. These qualities are retained even at very low temperatures, reducing the chance of the cable stiffening or cracking. On irradiation, the polymer insulation becomes extensively cross-linked, chemically inert, water resistant, and remains flexible at very low temperatures. Irradiated PE is heat resistant, and the insulation is less likely to shrink back, flow, or char when soldering, so you save initial and rework time, and achieve more reliable connections. In order to maximize noise rejection, Star Quad must be properly wired to the XLR-3 connector (or terminal block). Note: The high shield density makes it is somewhat difficult to push back the braid and pull the inner conductors through. Instead, we strongly recommend unbraiding the shield by combing it out with a pointed tool, beginning at the end of the cable. Effective AWG of combined twin conductors. Insulation Resistance/3 Mft = >1000M ohm.